We've said goodbye to crisp green salads and fresh tomatoes for the year. I've stopped taking monthly garden pictures because there isn't much to show- just brown stems and weeds and some very happy chickens who once again have free garden access. Instead of taking a walk to the garden to find dinner ingredients, I head into the pantry, the freezer and the un-heated mudroom. This is where meals originate this time of year. My cravings for wintry, comfort foods have started even though we've seen little signs of winter. I crave pot pies, tomato soup with grilled cheese, cookies, scones, soups and breads. One of my favorite comfort foods has always been macaroni and cheese. Mac and cheese and I go way back. The older of my younger two sisters and I routinely found ourselves on a mission in our mother's kitchen, at all manner of odd times of day, hovering over the pot of boiling pasta from the yellow and blue box of store-bought macaroni and cheese. A lot of bonding went on over those pots of boiling pasta and yellow and blue boxes. I think I've found something better. I'm thrilled to introduce you to a recipe that exudes comfort like I used to think only macaroni and cheese could and yet it lacks the (butter and cheese) guilt. This dish is creamy, full of flavor and, dad gum it, it's good for you. 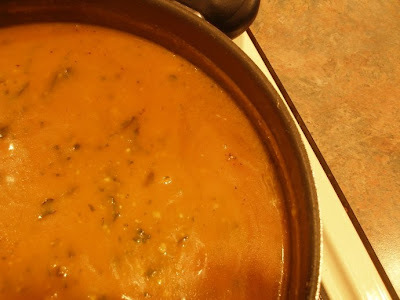 I came across this recipe years ago and made it a couple of times. It was okay, but I thought it could be so much more. This past week, leftover night found me with no leftovers. Sadie begs for "noonles" every night, so to appease her and to attempt to fulfill my dreams for this recipe, I tried to add what I thought was missing. It worked and I am in love. Cook the pasta according to the directions, drain and set aside. While the pasta is cooking, in a large skillet or pot, saute the spinach (or kale or chard) in the oil until it has wilted but hasn't turned brown. Add the squash puree, vegetable (or chicken) broth and pesto, stirring to combine everything. Bring the sauce to a gentle boil. In a small bowl, measure out cornstarch. Add one cup of the simmering sauce to the cornstarch and stir well with a fork until the cornstarch has dissolved. Add this back into the sauce pan and continue stirring until the sauce has thickened slightly. Remove the sauce from the heat and stir in Parmesan cheese, salt and pepper. Taste it and add more salt if needed. 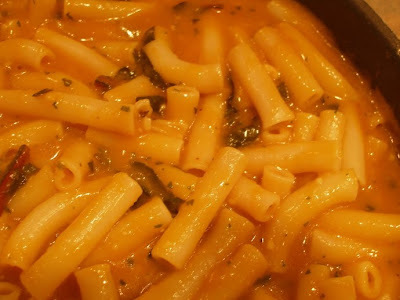 Add the drained and cooked pasta to the sauce and stir gently to coat pasta well. Pour into a 2 quart baking dish and a 8-inch loaf pan (I'm not sure why this odd amount, please forgive me) greased with cooking spray. Top with almonds. Bake at 350 degrees for 30 minutes or until the top has browned slightly. Devour. And do not feel guilty. My notes: One large butternut squash yields almost the exact amount of puree needed for this recipe. Cut the ends off the squash and cut it in half long-ways. Scoop out seeds and lay the squash halves cut-side down into a baking pan of 1 inch water. Bake squash at 350 degrees for about 45 minutes or until a knife inserted glides in with little resistance. Let the squash cool slightly. Drain off the water and scoop the squash from the shell and place it into a bowl. Using a potato masher, mash the squash until it resembles puree. 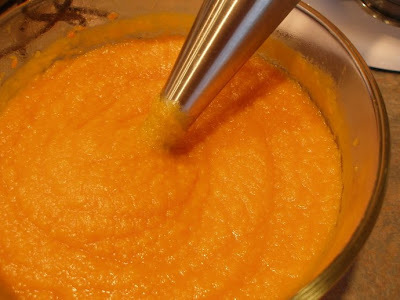 If you have an immersion blender, use it to puree the squash completely. If you don't, do not worry- this will still be amazing. I baked two squash at once and now have the exact amount of puree needed for another recipe waiting for me in the freezer. I was just about to send you my recipe for baked mac and cheese when I read "I've found something better." I'm glad you posted this... because I'm in a dinner rut... Monday we had leftovers... Tuesday we had split pea soup... and my husband asked if I forgot to add the peas...nice. Wednesday we had bagels and bacon... and last night we had our "weekly spaghetti." So this could not of come at a better time. This DOES sound good. I'll be keeping it in mind. 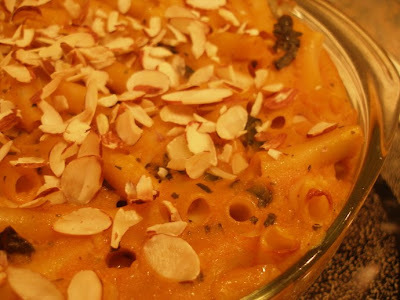 I am trying out the pumpkin pasta right now. I didn't have any pesto so I threw in some garlic and basil leaves. Smells yummy! I made this last night! Yea! My husband liked it! I don't know if it looked quite as good as yours, but it tasted great! I will say, my husband is a carnivore, and the only suggestion he had was to maybe add some chicken. I may try this next time! :) Thanks again! This looks so yummy! I'm definitely going to have to try this & I am really enjoying reading your blog!